The Easter breaks sees the conclusion of a busy spell for our school football teams. There have been many matches and blitzes taking place this half-term and over forty girls and boys have experienced wearing the school jersey in a competitive fixture. We hope that the children continue to work hard in school training, at the club and at home with the aim of developing their skills and representing their club teams this summer and long into the future. Thanks to Mullaghbawn CLG for the use of their facilities for our games and also to Frank, Tracy and the senior players who continue to assist with after-school training on Thursdays. Thanks to school coaches Fintan and Micheal from the Armagh Football and Camogie County Boards for all of their hard work with the P7 pupils over the course of the second term. The children really enjoyed the sessions and have gained a lot of knowledge and skills of both codes. Well done to the St Mary’s pupils and past pupils who won the Armagh Camogie Feile at the weekend. It was a remarkable achievement and everyone in school is very proud of you all. Best wishes to the entire team and management ahead of the All Ireland in Cork at the start of June. 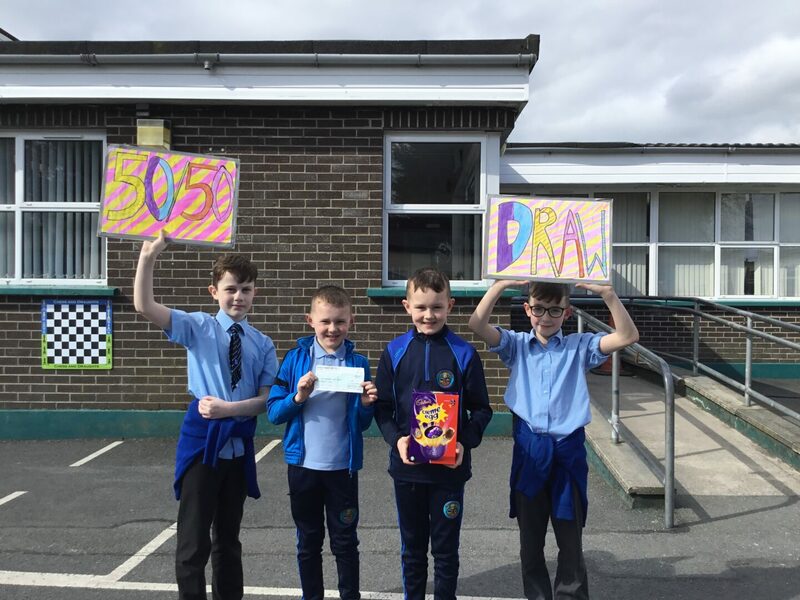 This afternoon we had our last 50/50 draw of the year and we are delighted to report that one P7 boy went home delighted with his cheque for a whopping £450!!! Thank you to everyone who supported this year’s draw, we have raised an incredible amount around £1,200 for school funds. We would like to wish everyone a very Happy Easter, we break up for the holidays on Thursday at 11.30 am. There are no buses on that day. School reopens on Monday, 29 th of April for the Summer term. Well done to the girls and boys from St Mary’s who recently competed in the Malachy McGeeney blitz. Both teams showcased the skills that they continue to work on after school on Thursdays and had a great morning’s fun. Both of our teams were placed third in their respective groups after playing the other six schools in attendance. Unfortunately this meant that they missed out on qualification for the county final by the narrowest of margins, as two teams went forward. Thanks to Mr McParland from St Peter’s, Cloughreagh for organising the event. Everyone associated with St Mary’s Primary School Mullaghbawn is extremely proud of our P7 pupil who recently competed in the Athletics NI Indoor Sports Hall Northern Ireland Final. A team of P7 pupils from St Mary’s recently attended the Newry heat of the competition and our pupil was selected to form part of the Newry team, based on his performance in the Newry heat. Cheered on by his siblings, he was just as competitive in the NI Final and was towards the top of the leader board in a number of events. There is no doubt in our minds that the future is very bright for this young man. 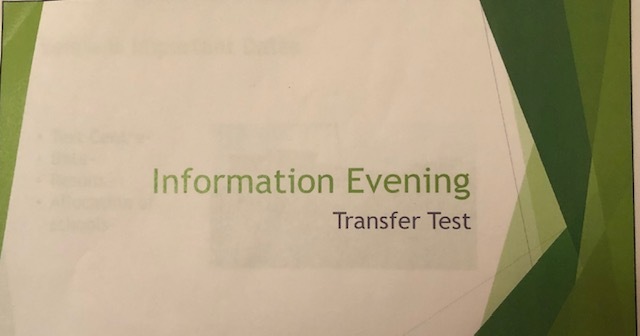 A reminder to all P 6 Parents about the Transfer Test, Information Evening, which we are holding tomorrow, Wednesday, 3rd of April at 7.30 pm, in the Assembly Hall. A huge thanks to David Pilkington from Sentinus for facilitating STEM workshops for all P6 and P7 pupils in school today. David, along with student teacher Mr Duffy, instructed the pupils on how to programme micro-bots to make their way around a course marked out on the floor. This helped to enhance their coding, mathematical, problem-solving and teamwork skills, as well as having lots of fun along the way. Well done to the St Mary’s representative who took part in the 2019 Newry Mourne and Down Environmental Youth Speak Final. There was a lot of hard work put in by the P7 pupil before getting up on the stage in Downpatrick and she certainly did her school, family and community proud. Well done! There was great excitement yesterday afternoon, when the winning ticket for our 50/50 Draw was pulled. 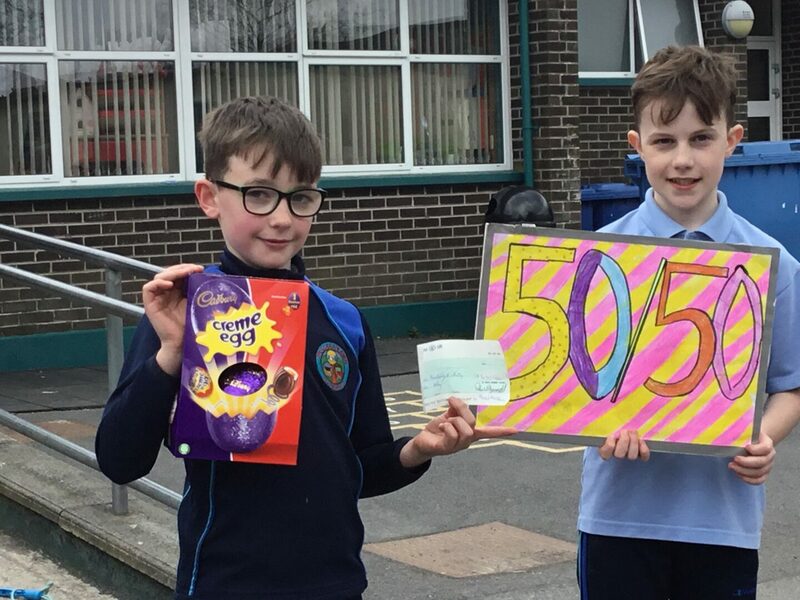 One lucky P5 pupil went home with a cheque for £185, he’s pictured here with his brother joining in the celebrations and hoping to get a share of the winnings!